You should be used to our posting the hacks that didn’t quite go according to plan under our Fail Of The Week heading, things that should have worked, but due to unexpected factors, didn’t. They are the fault, if that’s not too strong a term, of the person making whatever the project is, and we feature them not in a spirit of mockery but one of commiseration and enlightenment. This FOTW is a little different, because it reveals itself to have nothing to do with its originator. [Grogster] was using the widely-available HC-12 serial wireless modules, or clones or even possibly fakes thereof, and found that the modules would not talk to each other. Closer inspection found that the modules with the lack of intercommunication came from different batches, and possibly different manufacturers. Their circuits and components appeared identical, so what could possibly be up? The problem was traced to the two batches of modules having different frequencies, one being 37 kHz ahead of the other. This was in turn traced to the crystal on board the off-frequency module, the 30 MHz component providing the frequency reference for the Si4463 radio chip was significantly out of spec. The manufacturer had used a cheap source of the component, resulting in modules which would talk to each other but not to the rest of the world’s HC-12s. If there is a lesson to be extracted from this, it is to be reminded that even when cheap components or modules look as they should, and indeed even when they appear to work as they should, there can still be unexpected ways in which they can let you down. It has given us an interesting opportunity to learn about the HC-12, with its onboard STM8 CPU and one of the always-fascinating Silicon Labs radio chips. If you want to know more about the HC-12 module, we linked to a more in-depth look at it a couple of years ago. Thanks [Manuka] for the tip. Wireless is easier today than ever, with many standards to choose from. But you don’t need anything elaborate if you simply want to cut the cord. A few years back, [Roman Black] experimented with the cheap RF modules you can find on auction sites and from surplus electronics vendors for only a few dollars, and wrote up his findings. They’re well worth a look. The availability of cheap radio modules is making them ubiquitous in an increasing number of projects that we have been seeing recently. The usual go-to solution is using any one of the several modules based on the ESP8266 device. [Willem] wrote in to share with us his experiences with another radio module – the EMW3162 from MXChip, which at $10 isn’t as cheap as the ESP8266 modules, but is a more capable, power packed, device. The EMW3162 (PDF datasheet) is a low-power embedded WiFi module with integrated wireless LAN, and a STM32F205 Cortex-M3 microcontroller that runs a “self-hosted” WiFi networking library and software application stack. The microcontroller has 1M flash, 128k RAM and runs at 120MHz. And since MXChip is a Broadcom partner, they are allowed to use the WICED_SDK. The on-board ARM M3 means all kinds of useful interfaces are available: UART, SPI, I2C, ADC, DAC, PWM, TIMERS, GPIO, and a JTAG flash interface. The good news could be on the power consumption figures – the module is touted to be low-power, and the data sheet shows 7mA when connected to an access point but with no data transfer. When transmitting at 20kbps, the current draw is about 24mA, which goes up to 320mA at 11Mbps. [Willem] has his EMW3162_WICED repository up on Github, but also take a look at the MXChips MICO (Mico-controller based Internet Connectivity Operation System) repository. At the moment, he has it working using Linux, with a gnu gcc compiler and a JLINK JTAG programmer. He also has the WICED SDK working and has a WiFi AP with an on-board 120MHz arm chip. It would be interesting to hear about other users’ experiences with this radio module. Do let us know in the comments below! When you start looking into the Internet of Things, the first thing you realize is that despite there being grand ideas for Internet connected everything, nobody knows how these things will actually connect to the Internet. There are hundreds of different radio protocols being pushed, and dozens of networking schemes currently in development. The solution to this is a radio module that can do them all, talking to all these modules and serving them up to the Internet. This is the idea of [Hunter Scott]’s Level, a radio module with a frequency range of 30 MHz to 4.4 GHz. That’ll cover just about everything, including some interesting applications in the TV whitespace. [Hunter]’s module is based around TI’s CC430, basically an MSP430 microcontroller and a CC1101 transceiver smooshed together into a single piece of silicon. There’s bit of filtering that makes this usable in the now sorta-empty TV whitespace spectrum, something that a lot of IoT and wireless networking protocols are looking at. If the form factor of the device looks familiar, that’s because it is; the board itself is Arduino compatible, but not with Arduinos themselves; it will accept shields, though, meaning building a bridge to Ethernet or WiFi to whatever radios this board is talking to is really just a change in firmware. This board is excellent for experimenting with different radio modules, yes, but it’s also great for experimenting with different radio protocols. [Hunter] has been looking around at different mesh networking protocols. You can check out [Hunter]’s two minute video overview, along with a more detailed overview of the schematic below. The Raspberry Pi is an excellent tool to build the ‘Internet of things’ we’ve been hearing about, but there’s still the issue of connecting the Raspi to other devices. The EVE Alpha – a breakout board for several wireless radio modules for the Raspberry Pi – hopes to change that with their Kickstarter campaign. The idea behind the EVE is to provide a link between low-power radio modules found in a few of the microcontroller projects we’ve seen and the Raspberry Pi. It does this by simply serving as a breakout board, taking the GPIO pins on the Raspi and connecting them to solder pads for a few of the many radio modules currently available. 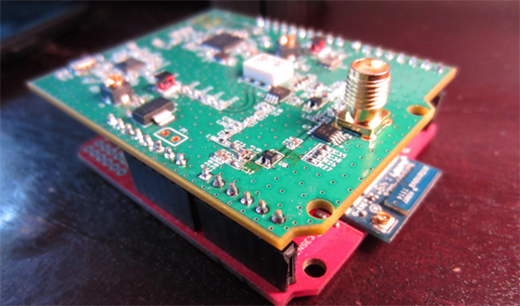 Already the EVE supports the RFM12B wireless tranciever, a Z-Wave module, 868-915Mhz SRF modules, and has a breakout for an XBee module, allowing the EVE to communicate using one of the many different XBee boards. There’s also a battery-backed real-time clock and temperature sensor thrown in for good measure making this board the perfect building block for an outdoor weather station or solar array. It’s an awesome idea, and if you already have a few radio modules, incredibly cheap; just the PCB is only £6, and a board with all the SMD components is only £20.